Gas prices are hitting record dollar amounts (if you ignore inflation). But, while you know that the government makes up a large portion of the pump cost, you may not realize how much (I didn’t). Here is the average cost of gas from May 2004 – April 2005 in Canada and in the United States. The chart also compares the prices with the taxes stripped. 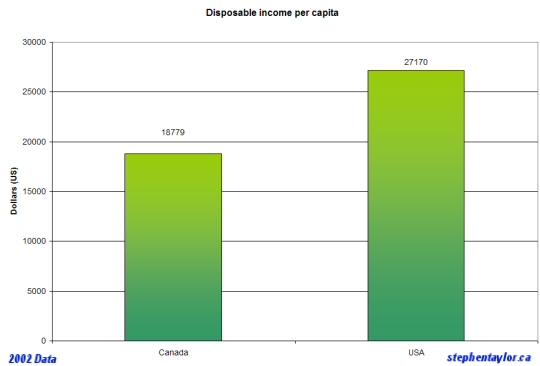 As one can discern from the graph, the Canadian cost (minus taxes) is actually somewhat lower than the US. I’d guess that this is because we’re a larger oil producer than the U.S. However, we pay higher at the pumps because of taxes. How does our tax situation compare? Well, if you’re a Canadian, you already know your taxes are higher than what an American pays. But, by how much? A full 38% of the price that we pay at the pump goes to the taxman while American only suffer 23%. And now for a correlative comparison (and while not the absolute and certain truth of cause and effect, it may provide some insight). The price of gas is tied into the cost of living. Virtually every physical product we buy (whether food, furniture, home electronics etc.) is delivered by truck and figures into the price we pay. Air Canada raised its ticket prices as a reaction to the soaring cost of fuel. The daily commute to the office is becoming a significant expense. Would it be in the government’s best interest to reduce taxes on the price of fuel to stop knee-capping the economy?